Citizenship and Immigration Canada announced yesterday that the working holiday visa quota for Irish youth will be nearly doubled, to 10,000 spaces by the beginning of 2014. Yesterday’s announcement, made during Citizenship and Immigration Minister Jason Kenney’s visit to Dublin, Ireland, comes just two days after news emerged that the length of working holiday visas for British citizens would be extended to two years from the current one. 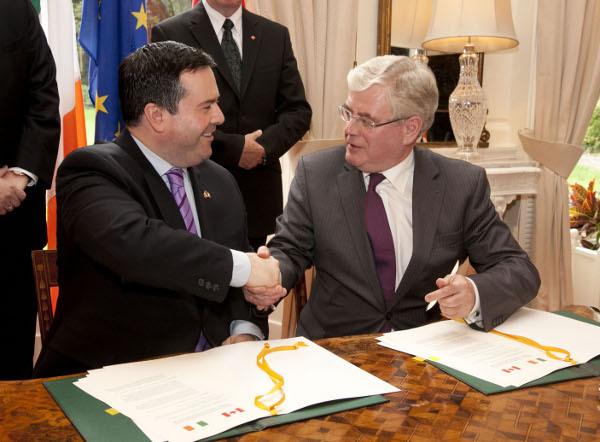 Mr. Kenney is in Ireland to promote Canada as a destination for Irish talent, many of whom are seeking foreign employment opportunities in the midst of their country’s economic problems. He is scheduled to visit Dublin’s Working Abroad Expo recruitment fair this weekend, where over 70 delegations from Australia, New Zealand Canada, and the Middle East are holding exhibitions to promote job opportunities for Irish people in their respective companies and countries. Canada has a reciprocal working holiday agreement with Ireland which allows Canadian and Irish citizens to temporarily live in each other’s countries for a ‘working holiday’, during which they are permitted to work to fund their stay. The Canadian working holiday visa is referred to as an International Experience Canada (IEC) work permit, and is available to Irish passport holders aged 18-35. Currently, Irish youth can apply twice for the IEC work permit for 12 months each time. Kenney announced yesterday that at the beginning of 2013, Irish youth will be eligible to apply just once, but will be able to stay two years. The change is intended to eliminate the inconvenience of Irish citizens who are working in Canada under the IEC program, being required to return to Ireland before the expiration of their first IEC work permit in order to apply for a second one.